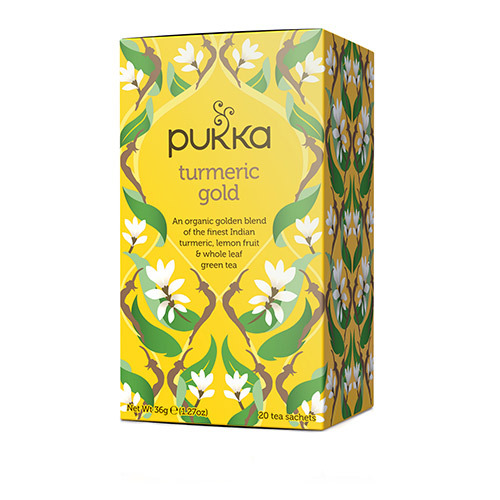 Pukka Teas Turmeric Gold is a golden organic blend of the finest Indian turmeric, lemon fruit and whole leaf green tea. 100% organically grown and ethically sourced ingredients: Turmeric root (40%), Suoi Gang green tea (20%), licorice root, cardamon pod, lemon Vana tulsi leaf, lemon essential oil flavour (6%), lemon whole (6%). 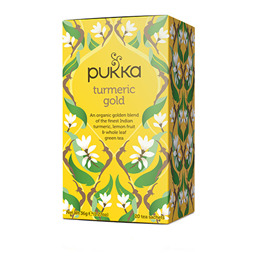 Below are reviews of Pukka Teas Organic Turmeric Gold - 20 Teabags x 4 Pack by bodykind customers. If you have tried this product we'd love to hear what you think so please leave a review. Amazing tea ! Bright yellow ! A great flavour. Turmeric is excellent at fighting arthritis aches in the colder weather and as part of self-care for those recovering from cancer. This is the only tea out of the Pukka range that I have never tasted before. If you love turmeric as I do, its a great tea. Lots of different flavours and so good for you. Love this tea, it has a delicate, refreshing taste and it does you good as well. It can be hard to find, was so pleased to find it on the bodykind website.